The World has a New Golfing Royal Family. Jason Day from Australia, of Filipino-Irish descent, has taken the world's number one ranked golf title as his ability is compared to the legendary Tiger Woods. Photo: Jason Day, 27 year old golf legend, in action on course. 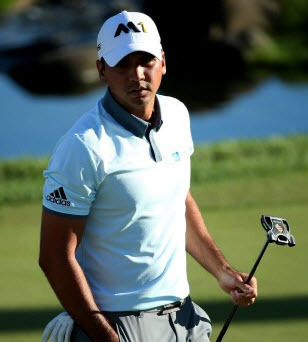 On the other side of the globe at Lake Forrest, north of Chicago City, Illinois, Jason Day from Australia has finished 21 under par and won by 5 shots in the BMW Championship as part of the US PGA Tour. He is now the number one ranked golfer in the world. Many golfing professionals in the USA and around the world are referring to Jason Day as the new Tiger Woods of the golfing world. Jason grew up in the Australian state of Queensland, born to a Filipino mother and a father of Irish-Australian descent. 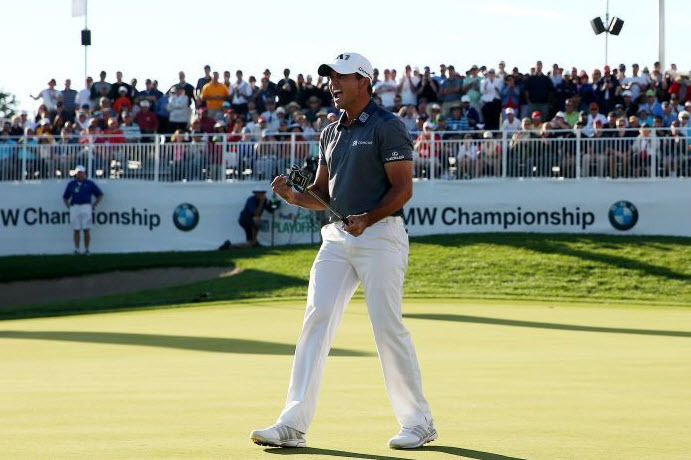 Photo above: Jason Day at the BMW championship near Chicago, USA. Photo right: Jason Day, with his beaming trademark smile which has endeared him to millions of fans around the world, holds the BMW Championship Trophy. Congratulations to Jason Day for all the hard work he has done on the golf course to realise his dreams. The world is looking for a new Tiger Woods and it seems Jason is well placed to take on this fame. Jason could also be on track to become one of the richest sporting personalities in the world. Jason is happily married to Ellie, who travels with him tournament-to-tournament and hole-to-hole. Their son, Dash, is adorable. 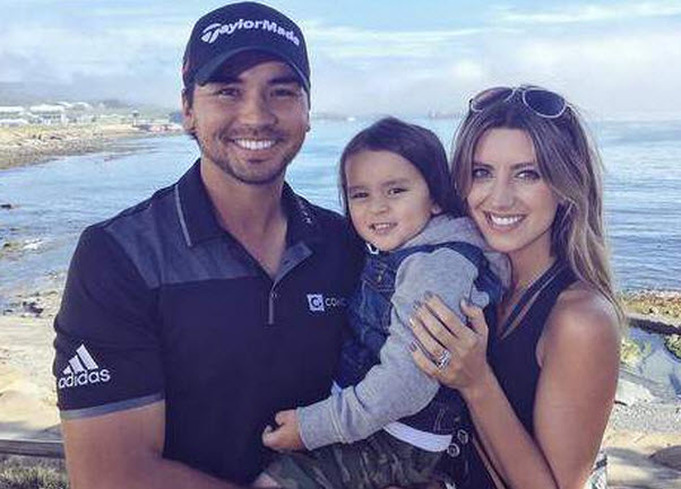 Photo: New Global Golfing Royalty - Jason Day, Dash Day and Ellie Day. Jason's father, Alvin Day, signed Jason up as a golf club member when he was just 6 years old. Alvin passed away when Jason was 12 years. Jason's mother, Dening Day, saw his talent and with limited resources she sacrificed all she could for her beloved son who was in his own admission a troubled teenager. Dening sold her house to ensure he continued his golfing by enrolling him in a prestigious International School with a golfing academy. In 2013 Jason Day's family faced major tragedy as the world's largest storm ever to cross land, Typhoon Haiyan (also known as Typhoon Yolanda in the Philippines) passed directly over the city of Tacloban in the central Philippines. Jason lost eight relatives including his grandmother, Adelaida. 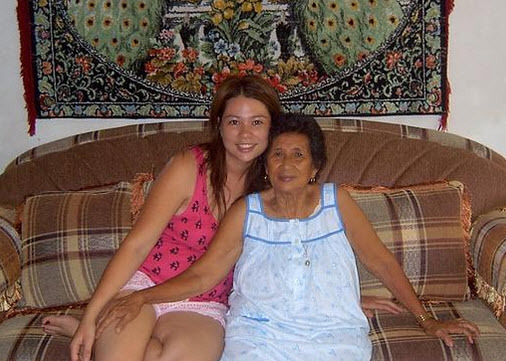 Photo above left : Jason Day's sister, Kim with his grandmother, Adelaida, before the typhoon which destroyed the city of Tacloban and killed his grandmother along with 7 other relatives. 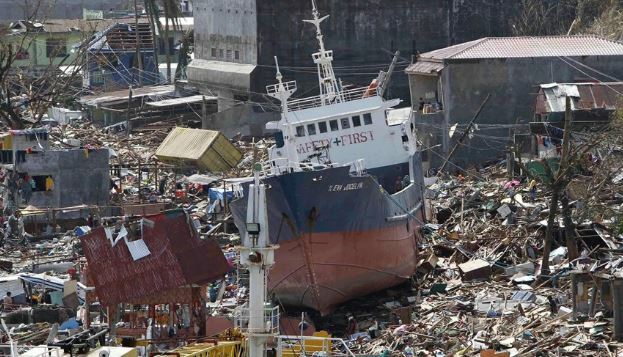 Photo above right: The destructive aftermath of the world's biggest storm to ever cross land in Tacloban City, central Philippines. Jason has also been short-listed for Sport Australia Hall of Fame's Don Award. Sir Donald "Don" Bradman was one of Australia's greatest sporting legends, who is also known as one of the best cricket players the world has ever seen. "The Don" also came from humble beginnings whilst demonstrating great spirit. The award includes demonstrating the finer values and spirit of a good sports person. It's based on Bradman’s declaration that qualities such as dignity, integrity, courage and modesty are compatible with pride, ambition and competitiveness. Jason Day's performance on and off the golf course demonstrates his ability to combine all of these qualities. This makes Jason a great role model for Australians, Filipinos and people all around the world.